FOIMan highlights upcoming events that you may be interested in. Just a quick post to highlight a few FOI and information rights events that you may be interested in. Firstly, a reminder that I’ll be chairing Understanding Modern Government’s “Excel at complying with FOI requests” workshop on 17 November. Amongst the other speakers will be Lynn Wyeth (@lynnfoi) of Zombie FOI requests fame, and a speaker from the Information Commissioner’s Office to update us on their new boss’s priorities. You can find out more and get a £50 discount by visiting the Understanding Modern Government website and entering the following discount code: MGPA4A2. The discount is available if you book by 11 November. If you want an in-depth look at subject access under data protection, places are still available on my Managing Subject Access Requests course for Act Now Training on 2 November. We’ll also cover handling of personal data under FOI during the day. Further details and booking can be found on Act Now’s site. Having got the plugs for my events out of the way, here are details of a couple of others that sound interesting. Is there a democratic deficit in the archives? If there is, it will be pinpointed at this event at Northumbria University on 24th and 25th January. Speakers include the new Information Commissioner, Elizabeth Denham, and Sarah Tyacke, former head of the National Archives and member of the Hillsborough Independent Panel. It sounds like it will be fascinating and a snip at £75. 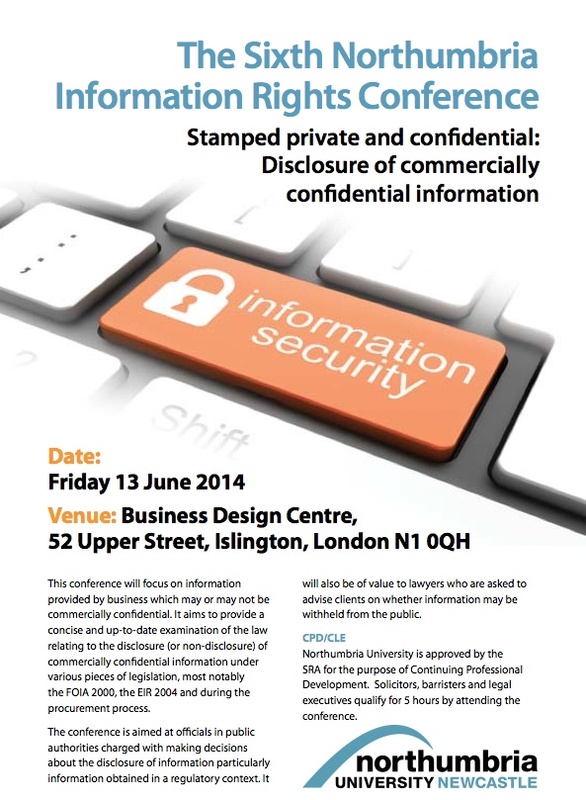 Always worth keeping an eye out for NADPO (National Association of Data Protection – and FOI – Officers) events. They have a couple coming up, one also featuring the new Commissioner. Unfortunately their events always seem to clash with my other commitments but if you can get a place, there is always plenty on their agenda that will be useful and interesting. Finally, the Information Law and Policy Centre at the Institute of Advanced Legal Studies (IALS) are hosting their annual workshop and evening lecture on 9 November. 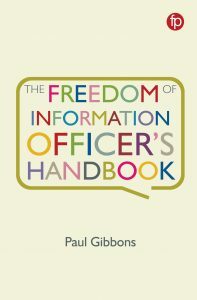 All sorts of interesting stuff will be discussed covering FOI, data protection, surveillance and human rights, all under the heading of “Restricted and Redacted: Where now for human rights and digital information control?”. And best of all, it’s free – but you have to book in advance. Unfortunately I can’t make it, but it does look a great event if you have space in your diary. 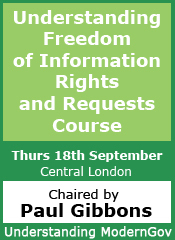 FOIMan to chair FOI and information rights event for Understanding Modern Government. In September I will be chairing a one-day event for Understanding Modern Government. Speaking at Understanding Freedom of Information Requests and Rights will be: Lynn Wyeth (@lynnfoi) of Leicester City Council; Dr Ben Worthy, Birkbeck College academic and expert on FOI and open data; Lisa Adshead from the Information Commissioner’s Office; and Heather Savory, Chair of the Open Data User Group. I’ll finish the day with a workshop looking at how to deal with some of the trickier aspects of request handling. This event proved popular when it was run in February, so don’t miss out. 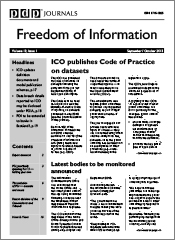 FOIMan highlights some events that those interested in Information Rights may want to attend. 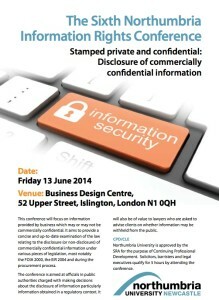 Last April, the Law Commission began a consultation on personal data sharing. The results will inform the Government’s next steps in this controversial and complicated area. The outcome of the consultation will be reported at an event to be hosted by the University of Winchester’s Centre for Information Rights on 1 July from 3.30pm. The Public Law Commissioner, Nicholas Paines QC will be speaking at the event. It is free to attend, but places must be booked. A few weeks ago I wrote about an upcoming conference organised by the University of Northumbria. 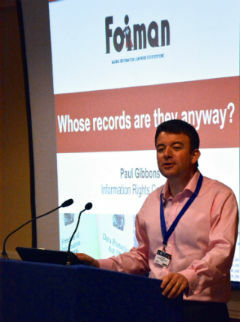 I understand that there are still places for their Information Rights Conference on 13 June (this Friday) in London, and that they are available at a discounted rate of £75. Details of how to book can be found in the conference brochure.